HTC recently introduced its U11 smartphone with the firm's unique Edge Sense functionality in India. After the launch of U11, the company has started developing its sibling variant with mid-range price band in mind.According to some rumors, the forthcoming mid-range smartphone from HTC has been codenamed 'Ocean Life' and sports Edge Sense 9.0. To recall, the HTC U11 was codenamed "Ocean" and as this handset appears to be a younger sibling to the flagship model, the information seems to be somewhat authentic. HTC Ocean Life smartphone was expected to launch by the end of 2017. This rumored smartphone comes in multiple colors such as Black, Pink Blue, and White colors. The HTC Ocean Life price in India starts from 15999. Let's talk about the HTC Ocean Life specifications to know whether you should wait for it or not. Coming to the HTC Ocean Life specifications, the Android phone is said to boot on Android 7.1.1 Nougat OS out-of-the-box. It is expected to be driven by a Snapdragon 660 SoC processor. The processor is paired with a 3 GB RAM for the smooth functioning of the device. As far as the camera is concerned, the mid-range smartphone ships with 16MP (Expected Dual) primary camera and comes with LED flash. The front facing camera features 8 MP (Expected Dual) and has flash support as well. The handset will feature a front panel similar to that of the HTC U11 or HTC 10. HTC Ocean Life smartphone is believed to come with a 5.5-inch Super AMOLED multi-touch display. The screen resolution would be 1440 x 2560 pixels, while the pixel density at 534 PPI. Also, Edge Sense functionality in the handset enables users to do specific tasks such as launching apps or can access specific features by just squeezing the device from the sides. The sensors placed on the side of the handset allow it to collect the input from the mobile users. The intensity of which each squeeze is recorded and can be personalized. In terms of connectivity, options on the mobile phone include GPS, Type C USB port, Bluetooth, Wi-Fi, 4G LTE, NFC and has a Dual sim support. The smartphone comes with 32GB inbuilt memory and does not support expandable storage. This is a major flaw as other devices in the same segment feature 64GB internal storage along with an option to expand up to 256GB. The phone is powered by 2600 mAh battery. The battery on the device could be on the higher side. Adding to that the phone will not be featuring quick charge or fast battery charging technology. Considering the HTC Ocean Life features, it appears to be a smaller and more budget-friendly variant of the HTC U11 flagship. To conclude, the handset will feature HTC sonic technology. This implies it will sport a 3.5mm headphone jack and instead will run audio via its USB Type-C port. Since these are just rumored features, we would request our readers to wait for official communication from the manufacturer itself. 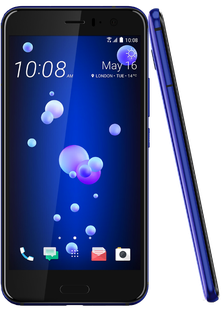 HTC Ocean Life full specs and reviews as of Apr 2019. Buy it here!